I bought too much asparagus. I didn’t think it was possible. But I did. We ended up working late and eating out more than planned last week – so I sadly looked in our refrigerator, and had to figure out just what to do with bonus greens slowly wilting in the crisper. 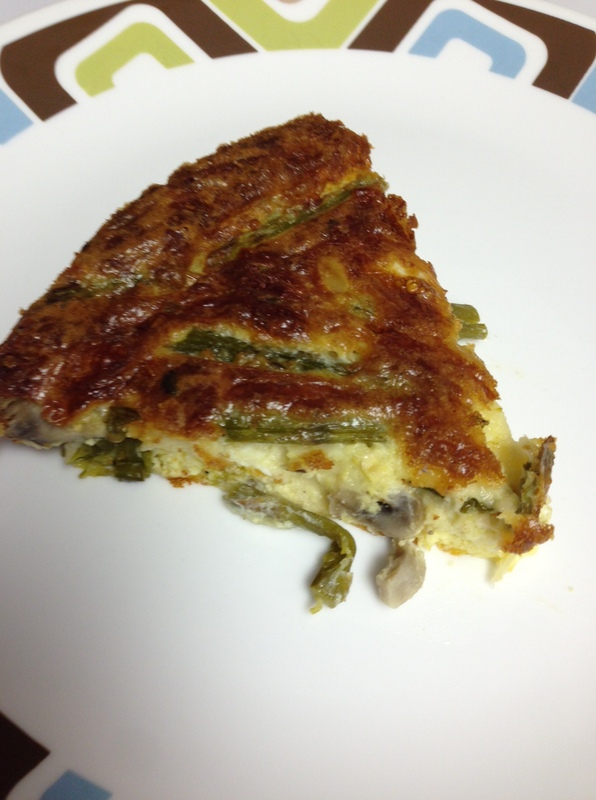 The verdict – make a quiche. Turns out my real man loves quiche, and it fits in our vegetarian focus…so I combined a few recipes I found online – and WOW. This was fantastic. I plan to make this a lot, with many variations. Who knew this could be so easy? This is also very affordable. The eggs were $1.20 a dozen at Aldi. The asparagus was $2/lb at Kroger. The mushrooms were $1.20 a container at Aldi. 4 cups of cheese was on sale at Kroger for $2.50. Not too shabby. Add in a salad and some garlic bread and you have a delicious dinner. Or brunch. Just a reminder, I love to experiment when cooking and rarely measure stuff…so these measurements are estimates. Be free. Make mistakes. That’s how you discover the good stuff – not just in food, but in life. In a medium skillet, heat 1 Tbsp over medium heat and saute onion about 3 or 4 minutes. Add in the garlic and cook until fragrant (but not brown! ), about 1 minute. 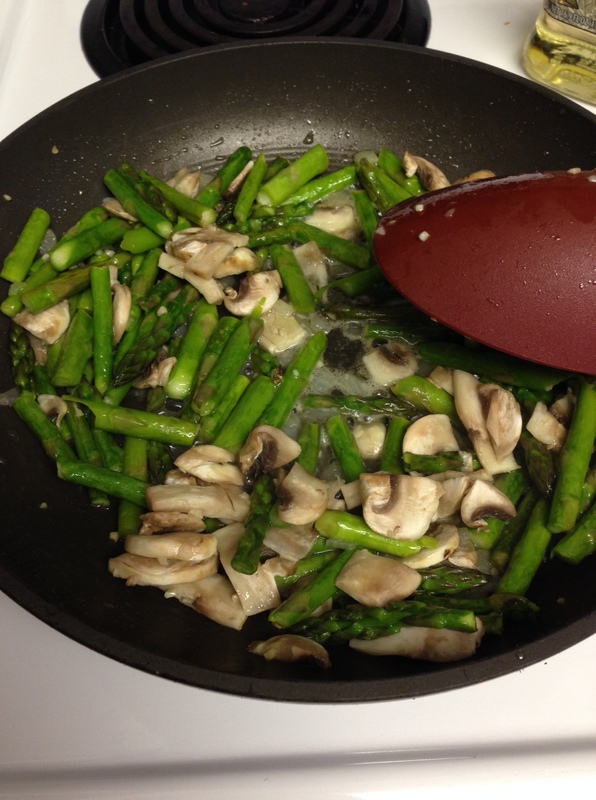 Add in asparagus and saute about 5 more minutes. Then add in mushrooms and saute for another few minutes. Add in the vegetables to the egg mix and stir. Lightly butter a 9 inch pie pan. Add the quiche mix to the prepared pan, and place in oven. Cook for 20-25 minutes, depending on how burnt you like your cheese. Now – get thinking. You could use any variety of vegetables you want to use up. Some future variations will include tomato, zucchini, spinach, faux-sausage, pesto…I can’t wait to try them! Enjoy! Let me know if you try this awesome quiche — and what changes you make to the recipe! 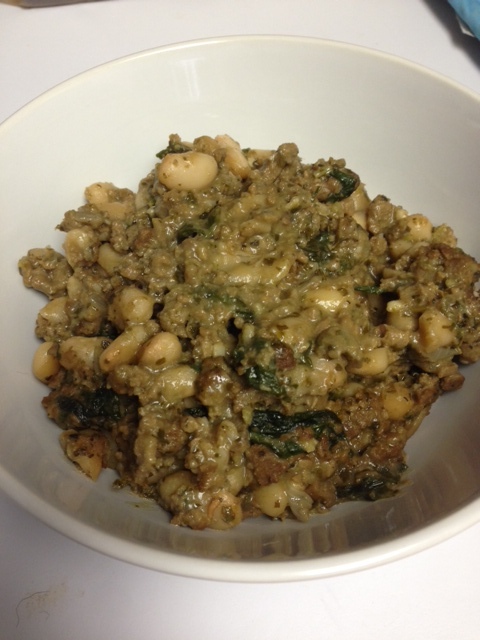 A new variation on a veggie skillet – Beans, crumbles and pesto! It’s been a hectic summer, so apologies for not posting more of the recipes that we’ve been creating in our attempt to be vegetarian as much as we can. And by as much as we can, I mean when we’re cooking at home. So I present to you the Meatless Bean and Pesto Skillet! This is a variation on the Tofurkey skillet from earlier in the blog, this time with pesto and meatless crumbles. This is also a hearty, inexpensive meal. The crumbles were on sale for $3. The broth for $.50. Beans are about $.75/each. Frozen spinach is $1.00 a bag. Pesto was on sale for $2.50 (and I used about 3/4 of the jar.) Figure about $10 bucks for all the stuff you need for this dinner. 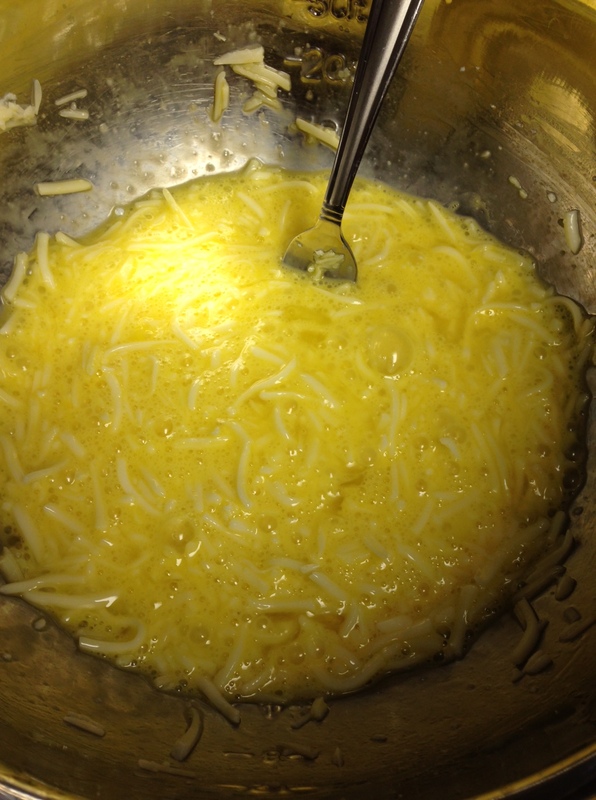 Made 3 really solid servings. Add in a salad and some crunchy bread and you can definitely get 4 servings. Here we go. This one is definitely husband approved. Ok – this couldn’t be easier. Dice the onion and saute in olive oil over medium heat for a few minutes until it’s really fragrant. Add in the minced garlic for just a minute or so – don’t let it burn! Add in the frozen meatless crumbles, the broth, the beans and bring to a boil for a few minutes. Add in the spinach. 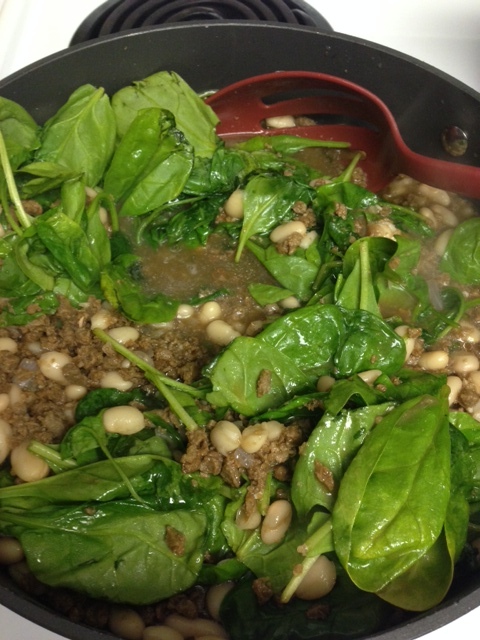 Let the spinach cook down, and some of the liquid evaporate. After 2 or 3 more minutes add in the italian seasoning and the pesto. Stir well and let simmer for 5 minutes until warmed through and all the flavors are mixed and delicious. Serve with some fresh grated romano cheese…and it’s really fantastic with some fresh french bread. We love lentils. They really are a lifesaver when you want something really good and hearty – but you still want to stay to your commitment to being healthy. I was tentative about the whole lentils thing initially – but wow – if you have any sort of international market, especially one that specializes in Indian food, you can stock up for cheap. A big bag of lentils was about $3. Onion soup mix is about $.50. Can of tomatoes is about $1.25. And we like the delicious and cheap combo. 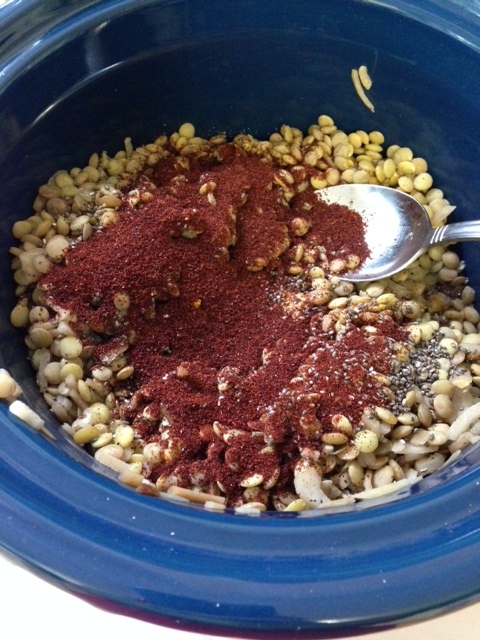 So here we go – Easy Crock Pot Chili Lentils! This couldn’t be easier. 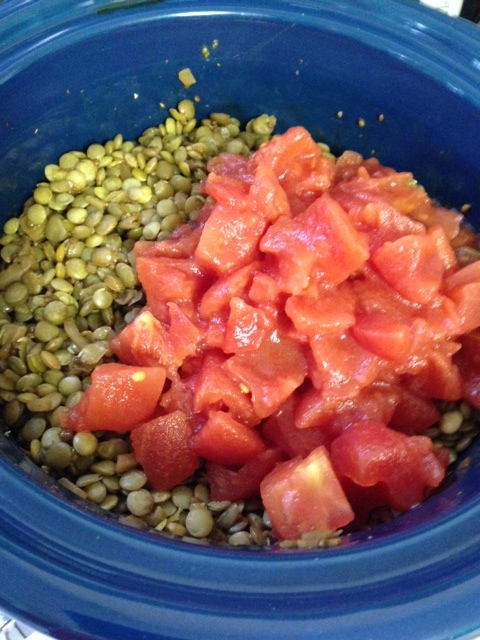 Put the lentils in a crock pot and cover with water. Add in the onion soup mix. Put the lid on and let it cook on low for a couple of hours. If the lentils soak up all the water, add in some more. After 2 or so hours, add in all of the other spices, stir. Put the lid back on and cook for 2 hours more. If the lentils soak up all the water, add in some more. Next, add in the can of tomatoes and the juice. Stir. if the lentils soak up all the water – you guessed it! – add in more water. Put the top back on and cook for another hour. Done. One of my crock pots cooks this faster than the others. But if you cook with crock pots a lot, you should know to just keep that in mind. Also, if you kick this up to high for an hour or two, you fast forward your dinner. Easy. On low, I do plan on 5 or 6 hours when I make this yummy dinner. We love eating this with saltines, corn chips, garlic bread…just depends what we have around (and if I’ve been to the grocery store!) Saving money can taste pretty good, eh? 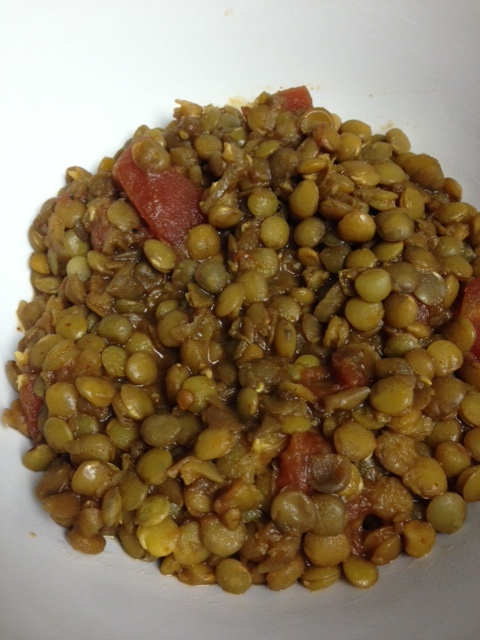 This one is so good…but be just know…If you haven’t eaten veggie in a while, the lentils may strike back a bit. Keep in mind just how high fiber of a meal this is. Don’t say you didn’t get a warning on this one!